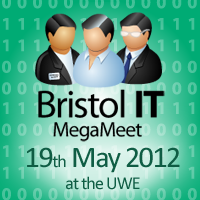 Come to the first IT MegaMeet in Bristol on 19th May 2012 at UWE. 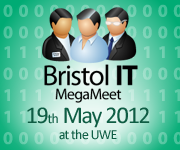 Help spread the word of Bristol's IT MegaMeet, and get the chance to win a bottle of Champagne. Sign up to the contest and promote the event with your unique tracking link. You'll be able to see how many visitors you've sent and how many registrations you've referred. The leader board shows who the current top referrers are. If you do not want to join the contest, but still want to link to us, then please use the badges below. Note: Simply using the badges below will not enter you into the contest. To be part of the contest you must join and use the unique tracking link provided from your login. This is a free to attend open source event. With no marketing budget we rely on you to get the word out. Please use the social links below. Thanks for sharing.